Though rooted in the ancient traditions of hunters and gatherers, CyberTracker has changed the face of conservation science. The field data collection tool is free, open-source, and compatible with an accessible and powerful software to manage law enforcement monitoring data — the Spatial Monitoring And Reporting Tool (or SMART). Equipping wildlife management personnel with these tools is at the center of African Wildlife Foundation’s strategy to improve protected area management and sharpen conservation planning — here is why. The application’s earliest users were San hunter-gatherers in the Kalahari, expert trackers with a vast knowledge of wildlife movements and behavior. Being non-literate, their useful insight remained outside of conservation science and wildlife management. In 1996, CyberTracker designed a custom touchscreen interface for traditional San bushmen to capture their observations with one click on a hand-held Global Positioning System (GPS) device. Since then, CyberTracker has upgraded this tracking technology, and it has been widely adopted across the world to monitor species distribution as well as habitat loss, wildlife crime, and other threats to biodiversity. CyberTracker and SMART have greatly streamlined the data collection and management process for protected area wildlife rangers and community conservancy or forest scouts. Both applications are installed on a smartphone or similar GPS-enabled mobile device designed to withstand harsh weather conditions, from the high humidity of Africa’s tropical rainforests to the hot, dusty landscapes in the north. On patrol, wildlife management authorities are on watch for target wildlife species and illegal activity that enable managers to identify at-risk wildlife populations and habitat. Tracking wildlife and threats using the conventional approach of GPS-recorded field observations paired with notations on data sheets can work effectively but quite often it does not. The approach is laborious and fraught with pitfalls — data sheets are lost or illegible, mistakes are made with data entry, or the information is simply never entered into a computer. Hard-won data is commonly lost and never influences adaptive management decision-making resulting in a significant waste of field sweat and scarce conservation resources. By contrast, the pre-programmed CyberTracker/SMART mobile device allows users to capture on-patrol observations in one simple step. The integrated technology automatically records the location and timestamp of biological indicators such as sightings, nests, or tracks of a particular species. For observations of illegal activity, users can also include information on expended cartridges, snares, hunting camps, and other signs of poaching. Photos of poachers and their wares can also be linked to the observations and uploaded to the SMART database as forensic evidence. 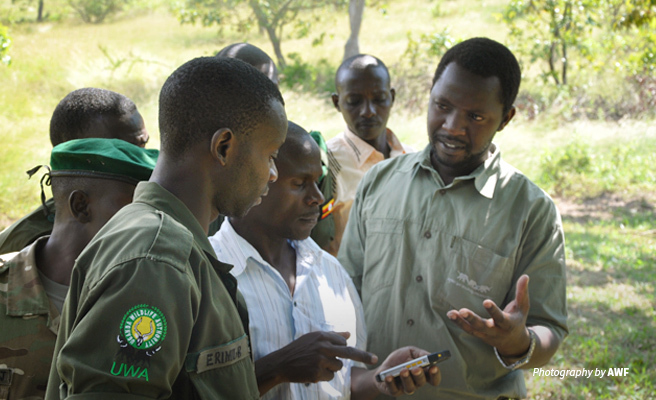 AWF trains protected area rangers and wildlife scouts in priority landscapes to use tracking software where limited resources for wildlife law enforcement are threatening wildlife. Since 2014, we have provided CyberTracker/SMART training and equipment in 17 diverse sites across seven countries. With AWF’s help, Uganda's protected area authority adopted CyberTracker/SMART nationally and AWF led introduction at several sites. Stationed at field offices, data managers use ranger- or scout-collected information to generate detailed analyses of wildlife and threat distribution and trends so they can adapt their conservation strategies as needed. With accurate evidence from a range of sources, authorities can direct on-the-ground law enforcement operations efficiently and measure progress towards conservation goals. Rangers and scouts, who in some cases risk their lives on patrol, recognize the influence their observations have on operations and commonly report feeling empowered and motivated. 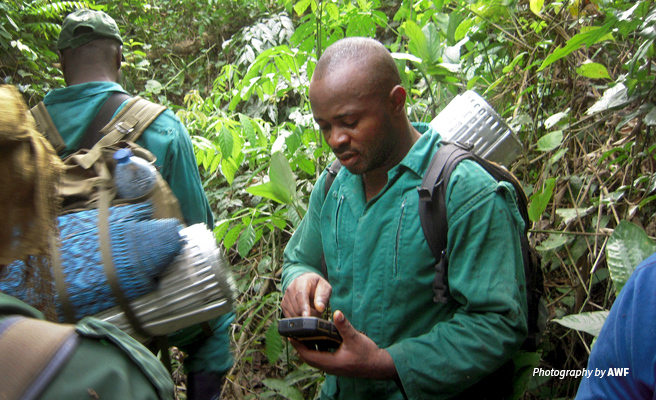 AWF technical advisors often play a crucial role in training rangers and data managers. At the same time, CyberTracker/SMART aggregates important metrics on patrol routes with time and distance covered. The software allows authorities to measure individual ranger performance, building a solid framework for staff accountability and reporting while also improving overall administration and governance. Ecological monitoring powered by CyberTracker/SMART in priority landscapes in Africa ensures systematic data collection over extended periods. For the wider conservation community, this trove of varied information — including biological indicators, land-use changes, and law enforcement metrics — presents many exciting possibilities for long-term planning and research. 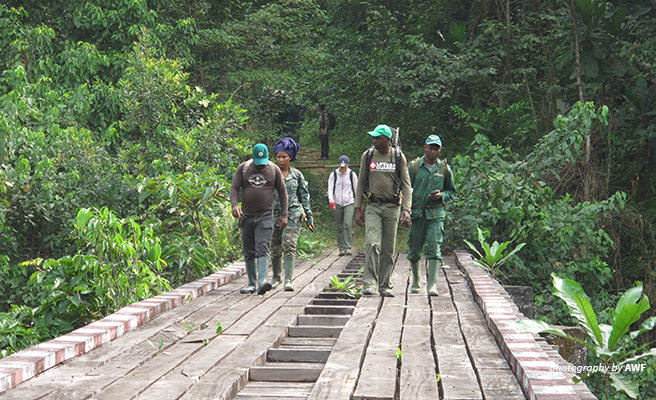 Many of the protected areas AWF supports have small ranger squads charged with protecting vast, often inaccessible terrain. With limited law enforcement reach, being strategic about deciding what areas to patrol is critical. To mitigate this problem, AWF GIS builds spatial models by intersecting ranger or scout patrol observations against a suite of environmental and socioeconomic spatial layers (such as vegetation cover or distance to roads or settlements). The models produce a seamless projection of the likelihood of key wildlife species and related threats such as hunting camps and poaching activity across the entire protected area. Informed by the spatial models, site managers can direct patrols into wildlife-rich areas at most risk to maximize their impact. As the main inputs are frequently updated patrol observations and satellite sensors, the spatial models can capture evolving wildlife-threat dynamics to inform agile management responses. With a broader view of wildlife-threat dynamics, not only do protected area authorities gain a better understanding of day-to-day incidences, but they also increase the chance of detecting illegal activities before they do harm. Different applications of CyberTracker/SMART software chart the occurrence of deforestation, illegal grazing, and small-scale agriculture as emerging drivers of habitat loss. Armed with this knowledge, conservation authorities can allocate management assets effectively and stay one step ahead.